K2 Promotions Tom Loeffler recently announced that the upcoming ‘SuperFly’ super flyweight card would be taking place at the now legendary StubHub Center in Carson, California on September 9th. That night almost all of the best super flyweights in the world will be in attendance facing fierce competition and one another. The card will be headlined by the rematch between former four-division world champion Roman “Chocolatito” Gonzalez (46-1, 38 KOs) and Srisaket Sor Rungvisai (43-4-1, 39 KOs) for the WBC super flyweight championship. The undercard will feature the American debut of Japanese star WBO super flyweight champion Naoya Inoue (13-0, 11 KOs). He will be taking on Antonio Nieves (17-1-2, 9 KOs). To start the festivities that night Juan Francisco Estrada (35-2, 25 KOs) and Carlos Cuadras (36-1-1, 27 KOs) will battle in a WBC title eliminator. The card from top to bottom may be the best card put together this year. There is a high potential for the card to provide multiple fight of the year candidates. More importantly, it highlights and makes the argument that the super flyweight division is the best division in boxing. 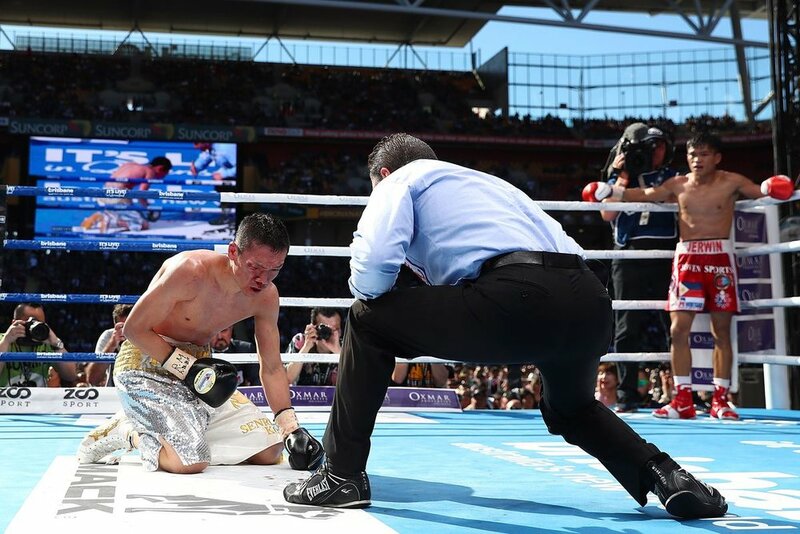 Last weekend on the undercard of Manny Pacquiao’s (59-7-2, 38 KOs) controversial fight with Jeff Horn (17-0-1, 11 KOs) another super flyweight shined under the spotlight. IBF super flyweight champion Jerwin Ancajas (27-1-1, 18 KOs) stopped Teiru Kinoshita (25-2-1, 8 KOs) in seven rounds with a brutal body shot. Ancajas showed that even after the ‘Super Fly’ card more great matchups could be made in the super flyweight division. There are also upcoming contenders in the division that can bring more attention to the weight class with an established fan base like the U.K.’s Khalid Yafai (22-0, 14 KOs). There is also the Philippines third three-division champion IBF flyweight champion Donnie Nietes (40-1-4, 22 KOs). The Filipino has been looking for a big fight and may make his way up to the super flyweight division. With the amount of match-ups available that can provide excitement at every turn, few weight classes are on the same level as the super flyweight division. The weight class also features at least two of the best in the world pound-for-pound in Gonzalez and Inoue. There are other weight classes in the mix that can also make a claim as to being the best in the sport. The welterweight division features the likes of Keith Thurman, Errol Spence Jr., Shawn Porter and Manny Pacquiao among others stands out as one of the best divisions currently. One weight class above welterweight we have the super welterweight division, which arguably may be stronger than the welterweight division. Super welterweight has fighters like Erislandy Lara, Demetrius Andrade, Jermell Charlo, Jarrett Hurd and promising young fighters like Orlando, Florida’s Erickson Lubin. While both the welterweight and super welterweight divisions can claim to be the best divisions off of who currently resides in the division that alone is not the only qualification to being the best. The most important factor is to have fights actually take place. To put together the ‘Super Fly’ card K2’s Tom Loeffler had to work with a multitude of different promoters. The willingness for these promoters to work together for the best to step in the ring with one another is an advantage that many weight classes do not have. Even with a vast majority of the fighters at super welterweight being under the same banner of Premier Boxing Champions, many fights have still not taken place between the best in the division to unify titles. Even if you do not believe that super flyweight is the best division in boxing it cannot be denied that there are now many weight classes in the sport that feature elite fighters that can make for memorable fights. With the recent announcement of the tournament seeding for the World Boxing Super Series that will highlight the super middleweight and cruiserweight weight classes, it is even more evident that boxing has turned a corner in 2017 in the right direction.